Liberia has been and remains a trailblazer in Africa and the world. Yet its four million citizens are among some of the poorest in the world. A true great President who will put nation above tribe is yet to come; and a President that will build Liberia to last is yet to ascend to power. Past and current Liberian political class, a league of extraordinary underachievers, either has been incapable of digesting lessons from mistakes made by past governments, or they are simply too greedy and have forgotten the oath of office they seek. 170 years after independence, the Liberian political class has failed to build a nation that caters to the socioeconomic development needs its citizens. Instead, every President and government since independence, have treated their constituents with contempt. Liberia’s foundation of democracy is modeled after that of the United States of America (USA), a land of liberty and freedom. However America’s slave relations with Black People left an indelible memory of abuse of former black slaves. Some White Americans, who feared the spread of the seed of black people as slaves were freed in the 1800’s, sponsored the creation of an outpost in Africa to return former slaves. This gave birth to an independent African nation – Liberia – where the first freed men of color, eager to return home to prove to the white man that they could rule themselves, established Africa’s oldest republic. After 24 Presidents and scores of interim Presidents during the civil war years (1989-2003), Liberians are yet to elect a true Great President; a President for all Liberians, not just for a small group of people, who controls the nation’s natural resource wealth. From Presidents Joseph Jenkins Roberts to Ellen Johnson Sirleaf, Liberian leaders have yet to learn any lessons from past Presidents. From 1847 to 1980, the Presidency was held exclusively by descendants of former slaves known as “Americo-Liberians” or Congau [Congo]. One of the longest serving Presidents was William V.S. Tubman, who ruled Liberia for more than 27 years. When President William R. Tolbert replaced Tubman in 1971 after his death, citizens had begun to agitate for change and opposition political parties became hostile to Tolbert’s rule. The status-quo was about to change as the “Progressives,” the newly minted opposition coalition, ceased on the moment to demand change. Liberia’s preamble and founding vision sought to create a nation that promotes “unity, liberty, peace, stability, equality, justice and human rights under the rule of law, with opportunities” for all. The establishment of the first free black republic in Africa, long before the rest of Africa rose up to take their rightful place in world history, gave “negroes” a new found hope in self-rule. Several African countries would declare independence more than a century later in the 1950’s and 1960;s (Ghana, Guinea, Ivory Coast, etc.) from colonial masters including France, the United Kingdom, Portugal, and Spain. That hope fizzled gradually as one government after another repeated the same old politics of “divide and conquer” while keeping indigenous participation in the governance of the country to a minimum. From 1847 to 1980, the Presidency was held exclusively by descendants of former slaves – the “Americo-Liberians” or Congau [Congo] People. Presidents William V.S. Tubman, who ruled Liberia for more than 27 years, did very little in terms of socioeconomic development programs. Tubman’s presidency is well documented for corruption and was marked by waste of resources. Tubman, an autocratic President and a lavisher of government resources, lacked the vision and determination to build his country. Like his predecessors before, he also failed the majority rural population by keeping them in abject poverty and in a quasi-police state until his death in 1971. When William R. Tolbert replaced Tubman after his death, he also made bold promises to Liberians, but fell flat on any meaningful reforms that would have improved education, healthcare, and infrastructure development. Some of his policies sought to gradually open up government to the indigenous majority, who had by now begun to slowly agitate as indigenous sons like Gabriel Baccus Matthews (late), David Kpormakpor (late), Tokpa Nah Tipoteh, and others returned home after studies aboard to advocate for majority rule. They began to organize against “Americo-Liberians” one-party state and status quo. Some say President Tolbert hasten his own demise after he got a brilliant idea to unite Africa and create a natural resource cartel, like OPEC. But the former masters were not having any of that. Others contend however, that Tolbert’s attempt to take Liberia eastward in international relations in the middle of the “Cold War” led to his murderous ouster. How dare the Americans? But the Cold War was not yet quite over and “American puppet-masters” were not yet ready to cede control of this tiny, but strategic country, which helped America and its Allies defeat the Nazi Germany during World War II. As Tolbert’s rule fizzle, so did clandestine activities intensify to remove him from power. Agitations by the “Progressives” led to confrontation, then clashes with the police, and to Tolbert’s ultimate killing in a bloody coup d’état on April 12, 1980. A low-ranking semi-literate Master Sergeant (Samuel K. Doe) emerged as the leader of the People’s Redemption Council (PRC). Samuel Doe declared himself head of state after his military PRC were credited for the bloody coup that toppled his predecessor. By this time, I was old enough to remember the early waves of social political upheavals that would ultimately lead to a civil war no one foresaw. I was a witness to the coup in Monrovia, as my family hunkered down in West Point, praying for conditions to improve. For the natives had finally ceased power, albeit a bloody coup. Did the end justify the means? It was a new dawn and a new era. It was also another opportunity to heal the wounds of division and tyranny and to transform Liberia. President Doe vowed to end corruption and redeem his people from 130 years of chronic nepotism, corruption, and one-party rule. The charges levied against President Tolbert and his government could have certainly stick in a court of competent jurisdiction, but Sergeant Doe and his advisers were too hasty to get rid of the evidence (“the ruling oligarchs”) and take hold of the of fruit of the crimes (“FOC”) of the century (the nation’s coffers). The PRC summarily executed scores of former government officials after swift trials in a military court; trials which many believed were unconstitutional. The PRC called on the Progressives including Madam Johnson Sirleaf, Matthews, Tipoteh, among others, to join the new military junta-led government. And join they did! As President Doe consolidated his grip on power, he enrolled more of his kinsmen in the Nation’s Arm Forces. However, as tensions grew, so did defections increased amid massive corruption and nepotism during the PRC’s rule – the same crimes for which Doe’s predecessor was accused of and killed for. Liberia’s new-found heroes, President Doe and the PRC, received millions of dollars in aid from the United States Government. But the new “masters of coins” had learned little from Tolbert and “Congau People’s” crimes against their own brothers and sisters. The soldiers soon got attracted to a life of abundance. The new occupants of the Executive Mansion became victims of the same old habits of their predecessors: Corruption and nepotism became a modus operandi. The PRC began to unravel early on during its rule. Some of its members, who were also military soldiers, were arrested on suspicion of treason. Others were allegedly executed by Doe’s secret service. Master Sergeant Doe became even more paranoid of his opponents and opposition parties after failed coup attempts against him by former comrades in arms, including Thomas Weh Syen and others. The Progressives, this time led by Madam Johnson Sirleaf, eager to remove President Doe, decided to take him on in the 1985 Presidential elections. Ellen and co lost badly because they were unable to form a united coalition against a Soldier President, whom many of them had overlooked. Doe, a novice at politics, beat the more experienced Liberian opposition at their own political game and declared victory, despite international reports of widespread cheating. President Doe now had the stage and the Presidential bully pulpit to make some drastic, but lasting changes that would have transformed Liberia for the better. But he also failed to see the greater vision! He was hell-bent on repeating the same mistakes! Madam Sirleaf did however win a Senate seat in 1985, but refused to accept the results of the election. She threw a political tantrum and a personal insult at President Doe, which landed her in prison. Some say Doe spared her life, but Madam Sirleaf survived a stint in prison and would later flee the country, albeit with a new personal vendetta: to get rid of Master Sergeant Doe. The National Patriotic Front (NPFL), formed in the United States and sponsored by Liberia’s very own sons and daughters, launched an all-out war to capture and eliminate President Doe at any cost, human or monetary. The NPFL was a brainchild of Ellen Johnson Sirleaf, who public admitted to funding Charles Taylor. With funding from other remnants of Tolbert’s regime, who sought to avenge the deaths of relatives killed by Doe’s PRC, and allegedly with tacit support from the US Government, who no longer had a need for President Doe, criminal Charles Taylor was whiskered out of a maximum security prison from U.S. soil, to lead an armed rebellion against Doe’s ruthless government. The rebel group, which became known as the “National Patriotic Front of Liberia”, had nothing patriotic about it. The front members’ goal was to seek personal enrichment and power at all costs. As Taylor and his NPFL forces closed in on Monrovia, Madam Johnson Sirleaf ordered her men to “level Monrovia,” if it required it and to eliminate Doe at all cost. And “Level Monrovia” they did along with the country’s infrastructure which was not spared during the decade-long violence. President Doe was eventually captured on September 9, 1990 and tortured to death by warlord Prince Johnson. Mr Johnson filmed the despicable act that has brought him fame and a Senate seat in his county. His brutal action however, has brought shame to an entire nation. By mid 1990’s, Liberia had become a failed state as warring factions fought for supremacy and control of lucrative mining and logging territories. In the midst of the war, my family had been displaced and we were running for our lives across the Liberian border and into neighboring countries. I ended up in Guinea, where I spent 10 years as a refugee. The United Nations deployed one of the largest peace-keeping missions at the time to keep warlords from eating each other’s hearts. As young rebel soldiers slaughtered civilians, women, and children across Liberia, their leaders (Taylor, P. Johnson, Boley, Konneh, R. Johnson, E. Johnson, Nimely, etc.) traveled across regional capital cities, in guise of seeking peace. Thanks to the United Nations (UN) peace-keeping efforts, relative peace finally returned to Liberia and general elections were held in 1997. Madam Sirleaf had defected to the new opposition block in her clever manipulation to win the presidency. To the dismay of many, Warlord Charles Taylor, adept at political rebranding, defeated a weakened opposition movement. Madam Sirleaf lost yet again another Presidential contest, but she was not done with Liberia. She concocted a new plan to get rid of Taylor by way of international propaganda and military pressure. Taylor for his part had not learned his lesson during his time in prison in the US. He also had not kept his promise to stop his meddling in regional conflicts for “blood diamonds.” His continued involvement in Sierra Leone’s brutal war and his predisposition to unleash chaos in other neighboring countries in West Africa was the last straw that broke the proverbial international community’s back. President Taylor, like his predecessors, had squandered another opportunity to bring lasting peace, development, and prosperity to Liberia. As a new round of fighting raged, resulting into civilians deaths in populated centers around Monrovia, the international community begged Taylor to cede power for the sake of peace. Taylor was about to meet his fate due to his intransigence and greed for power. President George W. Bush threatened Taylor with America’s military might, which led to Taylor resigning the Liberian presidency. 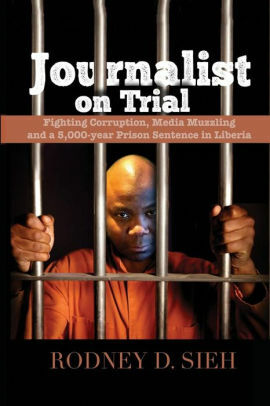 Taylor was in a league of his own: – an escaped criminal, who turned warlord, who became President; who would later be tried and convicted as a war criminal for crimes committed in Sierra Leone, not Liberia. The irony of his downfall! After a period of transition, another Presidential election was again held in 2005, in which Madam Ellen Johnson Sirleaf edged out soccer legend, George Manneh Weah in the second round. Although Weah and his popular Congress for Democratic Change (CDC) Party cried foul, regional leaders intervened and Weah conceded defeat. Not only did Liberia make history once again in 2005, the same legacy of corruption, nepotism, and underachieving with regards to the national development agenda, remains the order of the day. President Ellen Sirleaf’s administration began to fizzle even before the second half of her first term. Although Madam Sirleaf relatively kept the peace, she tactfully dealt with dissent, so as not to attract the wrath of international campaigners for human rights. Also, despite her bold plans like “making corruption public enemy #1”, “the Poverty Reduction Strategy,” “Vision 2030,”etc., Madam Sirleaf 12 years in power have proven to be a mixed bag. Her supporters have credited her for the cancellation of Liberia debt in the tone of more than two billion dollars and for attracting billions of dollars in foreign direct investments in mining, agriculture, and tourism. Just like Presidents Tubman, Tolbert, Doe, Taylor, President Johnson Sirleaf had learned little from her predecessors. Instead of putting national development at the top of her Presidential agenda, the madam had her plans: personal enrichment and international fame. When she took the mantle of power, President Johnson Sirleaf propped her government with her children (all three sons held key government portfolios): National Security Agency (Fomba Sirlef), the National Oil Company of Liberia (Robert Sirleaf), the Central Bank of Liberia (James Sirleaf), etc. Sirleaf’s relatives (sister, brothers, & in-laws), her friends, and those who helped fund her bloody civil war (1989 – 2003), were all given key government portfolios as payback for their support and loyalty. Sirleaf played dumb to calls for her to fire her children and relatives from her government. President Sirleaf government is on record as receiving the largest donor aid and international support to date, both monetary and material, yet performance indicators in education, healthcare, and economic indicators for Liberia remain dismal. Transparency International ranked Liberia # 90 for “least corrupt nations” out of 175 countries, according to the 2016 Corruption Perceptions Index report. Today, the “Sirleaf Dynasty of Dishonesty” may be putting final touches through fire sales of some key sectors of the Liberian economy as her government prepares to turn over state power to the next President on January 16, 2018. General elections are scheduled for October 10, 2017. In the midst of an election year, the ruling Unity Party of President Ellen Johnson Sirleaf is looking to pass the baton of power to her vice President. The VP has been a close ally of the madam. However, more than 20 opposition political parties are also fielding candidates for the presidency and vow to unseat the ruling party. For ordinary Liberians, it is a unique opportunity to elect a true great Liberian President, who will put Liberia First. However, not many of our people will take the time to explore and reexamine the current players in the political theater of Liberian politics, many who have learned little, if nothing from mistakes and bad policies of past regimes. As the campaign season heats up ahead of the October 2017 poll, I, like many who aspire to see a great Liberian nation, are wondering if the people on the other hand have learned anything from previous governments after 170 years of independence. The current political class of Liberia is in a league of extraordinary underachievers and voters must critically examine those seeking elected office before voting them in this year’s general election. With immense natural resource wealth, lush soils for agriculture, and a people yearning for change in policies that will transform the welling of all; Liberia deserves better. Liberians can do better! The bulk must stop with each of us who seek to see our nation developed beyond our wildest dreams. And for this to be possible, it will take the collective re-awakening of a nation, if Liberians are to learn anything from our rich history. Voting for another “underachiever” as President in the October Presidential election will only prolong our underdevelopment and economic stagnation. It is time to elect a true great President of Liberia!